Round up a willing opponent, grab your visor and go. Keep things simple and stick to you go-to list. Keep your fingers crossed for nice weather so you can make the most of it. Vaulted great rooms and open-plan layouts make your place feel even more inviting. You only have to drive 7 minutes to hit the slopes at Centennial Express Lift 6. Head to downtown Beaver Creek for shopping, dining and entertainment. It's a 14 minute walk from the resort. Pamper yourself with a visit to Allegria Spa. This full-service European spa offers a variety of massages, facials, body scrubs and nail treatments. Leave the video games behind and go for a hike. Beaver Lake Trail is a 5 minute drive from the resort. Start practicing your swing. Beaver Creek Golf Club is a 14 minute walk from the resort. Let’s hear it for convenience. Tucked into the trees in The Highlands area, The Meadows Townhomes has a blissfully easy on-mountain location just above the ski lifts. Because the townhomes are scattered across the property, the distance to slopes varies with each, but all are easily walkable (even with two shoulder-loads of kids’ ski/snowboard gear). Once you’re back from the day’s adventures, thaw out in the shared hot tubs – you’ll find one nestled between every two or three residences. One of the property’s biggest perks is access to the Park Hyatt’s 30,000 square foot, European-style Club at Allegria, where you’ll find every face and body treatment imaginable. Try the hydrotherapy in the Aqua Sanitas Water Sanctuary, or soak in the mineral pool or hot tubs under a mountain waterfall – there’s even a hair and nail salon. Let’s just say you can consider the better part of a day spoken for. Feel like dining out? It’s a short five- to ten-minute stroll to the lively Beaver Creek Village scene, where you can browse shops until your table’s ready. Got a sizable group? These townhomes can handle it – in fact, they welcome it. There are three-bedroom units (also in Premium and plus-den options), four-bedroom units (also in Deluxe and plus-den options), and even a five-bedroom layout to keep all your night owls and early birds perfectly content. Individually decorated, there’s both theme (mountain hideaway) and variations (alpine lodge to modern rustic-luxe). Vaulted ceilings mean bigger windows, which treat you to incredible views of the slopes. Each multi-level townhome has a fully equipped kitchen, private deck, cozy fireplace and onsite parking – plus a washer/dryer so you can stay a step ahead of the laundry situation. Beaver Creek caters to more than just the ski/snowboard crowd. During the summer season, you’ll find golf courses like Red Sky and Beaver Creek Golf Club, the Villar Performing Arts Center, which hosts symphonies and traveling Broadway shoes, a thriving dining scene and more. Local festival season features the Bravo! Vail Music Festival, Vail International Dance Festival. Oktoberfest and the Farmers’ Market and Art Show. Hit the hiking trails and bike paths until you find just the right spot to unpack your picnic. Or head for the rivers for fly fishing or whitewater rafting. And, given the fact that you’re on vacation, there’s certainly no shame in a spa and shopping day. - The front desk is open daily 8:00 AM-6:00 PM during summer months and 7:00 AM -10:00 PM during winter months. The check-in location is at 15 Highlands Lane, Beaver Creek, CO 81620. Guests that are planning to arrive after normal front desk hours must contact the property to receive a code to a lockbox that will have a key to the unit. Located in Eagle County, Colorado. 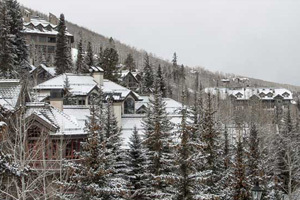 The resort is comprised of three villages: Beaver Creek Village, Bachelor Gulch and Arrowhead. Beaver Creek regularly wins awards for its service, lodging, food, wine and safety standards. SKI Magazine calls Beaver Creek "The consummate kid-friendly resort."